for long-range maritime use. Comprising of a receiver and a 6 kilowatt valve transmitter, station GKT was opened for service early in 1920, with a guaranteed range of 1,500 miles. The radio officers at GKT were housed in old army huts, with radiotelegrams being sent to and received from ships up to 5 days from any British port at the rate of 11d (just less than 5p) per word. Radio traffic was keyed to and from the London Central Telegraph office from the operating station for onward delivery. This two way “long range” service proved to immensely popular, and by 1924 it became necessary to expand the station at Devizes to cope with the increased demand. The GPO constructed a second long wave transmitter and built a new receiving station at Highbridge (near Burnham-on-Sea) in Somerset, to which most of the radio officers transferred. By 1926, experiments on short wavelengths had established that world-wide communication could take place. 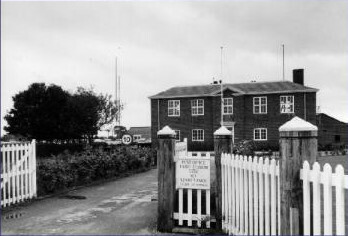 The GPO installed the first maritime short wave transmitter at Devizes, keyed by operators with receiving equipment at Highbridge that same year. Initials tests proved outstandingly successful, and it became necessary to construct a brand new transmitting station. This station was to be located at Portishead, near Bristol, and thus in 1927 Portishead Radio was born. Three long wave transmitters were installed, followed in 1929 by a new short wave transmitter, ultimately resulting in the closure of the Devizes station. Throughout the 1930s this long range service expanded greatly, with a gradual decline in the use of the long wave (short range) service, however, new markets were being discovered, including the use of Portishead by the Morse Code operators on the flying boats, passing traffic from as far as South America and India. The great liners were also making heavy use of this new service, and by 1936 Portishead Radio, now with 4 short wave transmitters, was handling over 3 million words of radio traffic with a staff of 60 radio officers. The war years between 1939 and 1945 saw great changes in the role of Portishead Radio, two way communication with ships changed to a broadcast of traffic without any acknowledgment of receipt. For obvious reasons, transmissions from ships were kept to a minimum so as not to release their positions and destinations. However, distress calls, enemy sighting reports, news of the North Africa landings and clandestine signals from Europe ensured the station was kept busy. Early in 1943, the workload had increased to such levels that Portishead’s civilian staff were augmented by naval operators from HMS Flowerdown. Many of the civilian staff were seconded to Government services at home and abroad, not only to man radio stations but to train the many new radio officers needed for convoy work. A special aircraft section was constructed to maintain communications with patrol aircraft in the North Atlantic. Peacetime brought a return to commercial activities, and with it a vastly increased demand for long range communications. An “area scheme” was established in 1946 to enable British and Colonial registered vessels to use naval stations around the world to relay their traffic to Portishead. 1948 saw the opening of two new operating rooms with 32 operating positions, a broadcasting and landline room, and a central control room with a steel plotting map of the world measuring 36 by 16 feet. A bureau file of both ship and aircraft positions was maintained, and many were plotted with magnetic indicators. During the late 1940s and early 1950s transatlantic liners provided a high volume of traffic, all using radiotelegraphy (Morse Code) transmissions. The development of the landline telex service enabled customers to deposit and receive traffic directly from Portishead, with high traffic users installing their own private wires. The Suez crisis in 1956 brought high levels of telegraph traffic in both the to-ship and from-ship directions, leading to increased staffing levels towards the end of the decade. The 1960s saw the station continue to expand, with increased traffic levels and the development of a telex over radio (TOR) system. A press transmission of news was transmitted by morse to enable ships to produce their own news sheets. By 1965, 86 radio officers were handling over 11 million words of traffic per year, and communicating with over 1,000 ships each day. The introduction of the Daily Telegraph transmissions to the QE2 in 1968 by radiotelex was another first for the station. April 1970 saw the transfer of the radiotelephone service from Baldock to Portishead. This necessitated the use of extra transmitters at Rugby and Portishead, and the temporary use of an additional control center at Somerton (Somerset). The area scheme previously mentioned was terminated in 1972, and with it the Naval presence at Portishead. However, traffic figures continued to rise, with the developing oil market and the deep water fishing industry all providing work for the station. The leisure market continued to expand, with the early round-the-world yacht races providing valuable publicity for Portishead Radio and its services. By 1974, traffic levels had increased to over 20 million words per year, now handled by 154 radio officers. Further expansion of the present operating area was impossible, so in 1976 work commenced on a purpose-built building to house the various services then available to ships. A new computer based message handling system was installed, and the manual radiotelex service became more popular, resulting in the development of an automatic system. The Portishead transmitting site was closed in 1978, leaving the sites at Leafield and Ongar, operating alongside the main transmitting site at Rugby. However, the famous name of Portishead Radio was maintained to provide the maritime community with a familiar and well known service. The advent of satellite communications in the early 1980s had little initial impact, and in 1983 the new control center was opened, providing new radiotelephone and radiotelegraphy consoles, with automatic radiotelex being installed later that year. Remotely controlled receivers and receiving aerials, located at Somerton, were utilized for all services, resulting in the dismantling of the receiving aerials at Highbridge. The old operating rooms were demolished, creating space for administration offices and stores. industries based in remote locations in Africa used the aero frequencies, culminating in the opening of the Gateway service, which continues to flourish to this day. Relief agencies, military units, embassies, and industries still use the service, which acts as a lifeline to those located in countries where normal landline links are poor or non- existent. By the end of the 1980s, satellite communications were making significant inroads into Portishead’s traffic figures. It became clear that a severe rationalization program was necessary in order for the station to remain viable, which resulted in the closure of the transmitter sites at Leafield and Ongar. The number of operating consoles was reduced in line with the decline in radio traffic, and the number of staff employed fell proportionally. Portishead Radio currently provides employment for 50 radio officers, and around 100 ships a day use the Morse Code service. This figure is expected to decline during the next few years, and by 1999 Morse Code communication is expected to phase out, although there may still be some older vessels still trading who may need to use the facility. The radiotelex and radiotelephone services still, however, maintain a reasonable level of traffic, and the bureau messaging services to our maritime customers remain popular. Portishead Radio remains the most famous maritime radio station in the world, and the mere mention of its name is likely to provoke fond memories by those radio officers who used the service in its heyday. Whilst the days of receiving weak radio signals from a passenger liner from the South African coast are long since gone, Portishead Radio continues to provide a valuable service to the world’s maritime community. Portishead Radio closed on the 30th April 2000.